Everything you need to create espadrille shoes for yourself and your child in one beautiful package for those folks who already have the fabric! 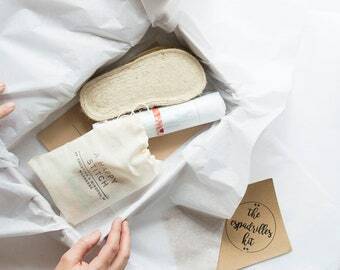 The Espadrilles MY FEET & YOURS I Got It Kit is perfect for getting you started making your favorite little person their own shoes to match yours. This Kit comes with the option of either a women's flat shoe or a wedge (with a 3" heel). It's pretty enough to give as a gift to a new mama. It's such a fun project for a birthday or Mother's Day gift for a crafty mama (or papa!). Project requires approximately 1/3 Yard of outside and lining fabric for each pair of shoes. This kit includes needles, espadrille thread, wax, needle puller, elastic, the necessary interfacing, an instruction booklet, pattern, and shoe soles. I hand sew many of the kit accessories and include my own adult and child booklet with fitting tips, a how-to for the classic reinforced toe as well as step-by-step instructions. Just pick the shoe sizes and please leave a note if you would like an alternative color of yarn thread. I automatically include the bone-colored thread as it is classic but you can request from blue, black, white, pink and red if you would prefer. Note: This project does require a sewing machine and knowledge of how to sew. Finished shoes pictured are as an example only, if you are interested in MY FEET & YOURS kit with fabric look for the Starter Kit! Shoe soles run big so if you are a half size I recommend you choose a shoe sole a size down. Having a hard time choosing the size? I know that sizing can be tough, please refer to each size chart for more detailed information. Measure in inches, as straight as possible, from the heel to the top of the big toe. I apologize to my well-grounded friends, at this time I only have up to size 9 for women's flats and size 10 for the wedges. I hope to expand in the future! Thanks for understanding. I do my very best to make my kits eco-friendly including a recycled box, organic lining fabric and using fabric scraps for decorative components in an attempt to be as low-waste as possible. Even my business card is made out of old t-shirts! At this time, however, I am unable to source organic canvas fabric that is perfect for the outside of the shoes. 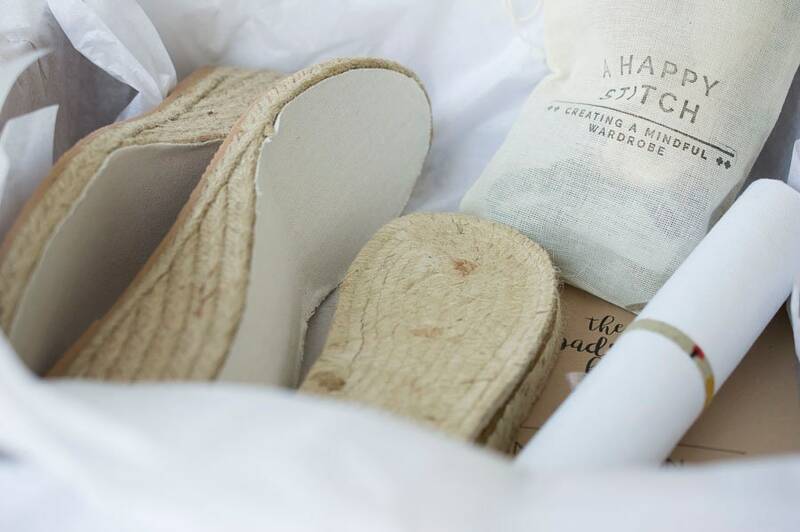 Please see my blog, ahappystitch.com, for the post Eco-Responsibility & The Espadrille Kits for a detailed look at every component. Please note: You will need a sewing machine and thread to complete this project and the instructions assume you know sewing basics. This listing is for a kit you or someone else may use to make espadrille shoes, it is not sale of a completed pair of shoes. Shipped quickly, quality materials and the hand written note adds a nice personal touch! Item arrived quickly and wrapped adorably! Looking forward to using the kit. I accept payment via paypal and credit card. If you need to pay some other way, convo me and we will work something out! I generally cannot accept returns but If anything arrives damaged or missing please let me know as soon as you can and I will fully refund you! All items, except patterns that are usually via email, are shipped via regular mail at the lowest rates possible. I ship a few times a week, so it may take 2-4 days to arrive at your door. Let me know if you need it faster and I'll do what I can! Any orders listed at PRE-ORDERS will take 3-4 weeks to ship. Convo me if you would like to upgrade your shipping and I will adjust the shipping charge accordingly. A 6.625% charge will be added to all items shipped within the state of New Jersey to account for sales tax, this does not include clothing. This charge is included by etsy.com.